Change your life with Eight Key Strategies to finding Happiness and Success. Imagine if you could completely overhaul your life in a short period of time. Imagine if you were given the eight key strategies to unlock your true potential, allowing you to find happiness and success in all areas of your life. Imagine if those secrets were all contained in the same book. They are! 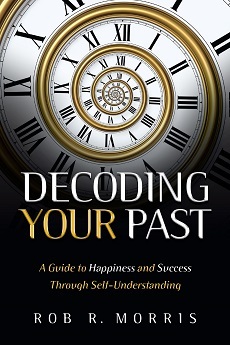 In Decoding Your Past, author Rob R Morris lays a foundation for the eight key strategies to happiness and success that will change your life forever. The book is a common sense approach to bringing about change in your life; putting your life on a path to happiness and success through a true self-understanding. We must understand where we have come from to understand where we are going. We can’t change our patterns of behavior if we can’t understand our current behaviors. We can’t change our thoughts if we don’t understand why we think the way we do; It's all predicated on our past experiences. Many of us have traveled a harsh road, but that doesn’t determine our outcome…unless we allow it to. I believe in the power within each of us. But… you must also believe in YOU! The most important thing I have learned is that we all have the ability to change and become something great no matter what the past has presented us. The power lies within each of us whether we realize it or not. We can overcome and change our course. When you are done here, please visit me on my main website. I have a variety of articles and information geared toward changing your life and outcome. I really connected with this book and so will you! I received this book as a gift, and a gift it was indeed. It's a straight forward and honest look at life's challenges with ways to look at and deal with them. I could really identify with the experiences the author so candidly shares. Especially liked that there are actionable steps outlined in the book to overcome the challenges that life throws your way. By page six, I was shedding tears and couldn't put the book down. I literally read it within a couple nights. I've passed this book on to a dear friend and my roommate wants to read it next. Don't think about getting this book...GET IT AND READ IT! Great book and I highly recommend it! I am glad that Rob Morris wrote this book because I can relate to it. The book is well written and you can tell that he wrote it from the heart. He wants to help others to overcome their adversities and to be successful by decoding their past. And, I liked that each chapter had a quote at the beginning. This is a book that I will go back to for guidance and encouragement. Buy Your Copy of the Book TODAY. Don’t Wait Another Minute – Take Control of Your Life Right NOW! I value feedback. I am always interested in how my writing impacts the reader. My purpose is to be a resource to others. Please take a moment to connect and share your feedback or story. I regularly write articles on topics that interest me. They tend to be geared toward self-improvement which is my main focus. I have had many compliments on my articles and readers relate to the messages. Don’t miss this amazing opportunity… Rob's powerful and hard hitting 90 minute seminar is designed to give you key information to changing your life’s path. It’s an inspiring message you won’t want to miss. Change your life and promote growth beyond what you could ever imagine.